The greatest dance hall in South Bend, Ind., is of high class and is patronized by South Bend's most select dancers. The orchestra, known as the Tokio Orchestra, has won fame throughout the middle west, through its periodical tours. 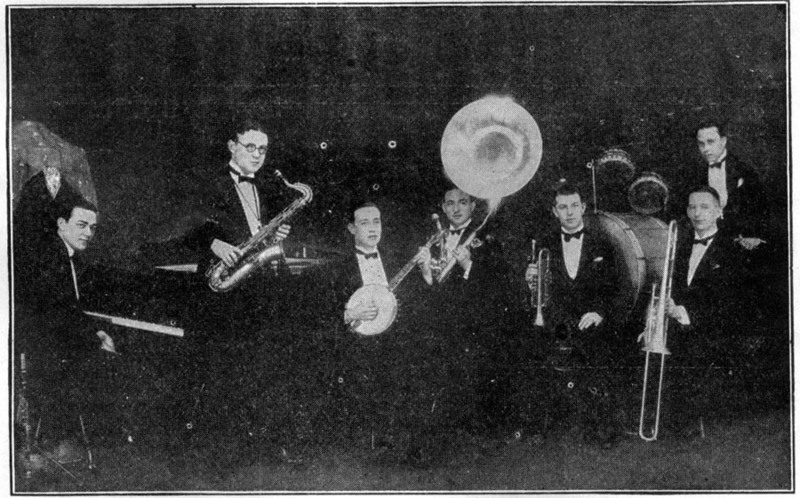 It comprises Fred Hulme—Trumpet; Russell Barclay—Sousaphone; Clayton Stults—Drums; Chas. Davis—Piano; Geo. Miller—Banjo; Keith Finley—Saxophone; Ross Reynolds—Trombone, and Ralph Dunken—Banjo and Vocal. The Conn Instruments used are a great delight to the members, as they are pleased to state. 1. C. C. Conn Ltd. Musical Truth, Vol. XI, No. 30, Elkhart, Ind., May, 1922, page 27. Are you looking for DUNKEN ancestors? If so, we suggest posting a query to our Community Message Board to get assistance from other researchers.